One of my favorite Saturday morning cartoons to watch back in the 1980's was "The New Adventures of Gumby." I used to watch this show with my brothers, while having our cereal and planning out the rest of our day. I personally was a fan of Pokey, Gumby's dog sidekick. Back in the 80's was when the Californian Raisins clay-animated movies and commercials were big, and so was Gumby and friends. Kids my age were watching this show and collecting the bendable figures which we bought by saving up our allowances. I still remember bringing my oversized Gumby bendable figure to school for show and tell and sharing with my classmates some of my favorite episodes from this iconic clay-animated series. So, when I heard the folks at NCircle Entertainment were releasing a DVD set, which included the entire over 250 minutes from the 1980's, along with bonus content, I couldn't wait to get my hands on a copy, so that I could share this show with my girls. This Volume 1 set also included two cute bendable toys to collect and play with, as part of the box set. For the past few weeks, I have been sharing this DVD set with my girls. We have been watching a couple of the full-length episodes at a time, and then talking about our favorite parts in each. I love hearing my girls get excited about the show, and seeing them enjoy it just as much as I did as kid, and still do today. And, I am so happy that NCircle Entertainment released this DVD for fans of this popular 1980's show to pick up and reminiscence and share with their kids. I will definitely be on the lookout for future volume releases, so that we can complete the entire series, and enjoy Gumby whenever we want to. 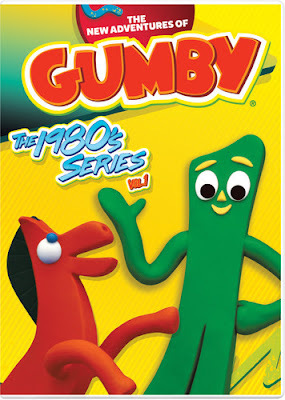 "Welcome back Gumby and Pokey in this wild, wacky and inventive collection of 80's episodes! Featuring 50 clay-animated episodes, fully re-mastered from their original camera rolls and soundtracks. Also making appearances are Prickle, Goo, the Blockheads, Professor Kapp, Dr. Zveegee, the Moon Boggles, and Gumby's parents Gumbo and Gumba. 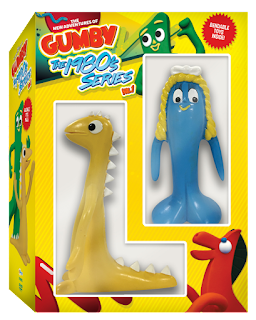 New characters include Gumby's sister Minga, Denali the Mastodon and Tilly the chicken! The gift set includes 2 exclusive bendable toys!"